Spacecom’s Amos 5, launched on December 11th 2011 by ILS from Baikonur, was commercialised on January 25th. Some C-band clients have recently been relocating from Spacecom’s temporary leased capacity (the former AsiaSat-2) to the new satellite at 17 deg East. However, there are also further considerable expansion plans afoot with rumours that a new satellite order for Amos 6 can be expected in the next few weeks, and that the new craft will be equipped with Ku-band and extra capacity from Ka-band. The bulk of that business is coming from telcos and similar service providers. Now the extra capacity can come into play and Amos – although not alone – sees considerable business coming from trunking, backhaul and similar satellite-based traffic in both broadcast and data services. Ilany says that they are seeing good, solid business being done at attractive transponder rates. The growth in demand meant potential revenues were not subject to over-supply of bandwidth, said Ilany, and that prices/transponder were holding up very well. Ilany is sensitive about what that business backlog might be in US dollar terms, and with Spacecom being a quoted company, was reluctant to be specific without his CFO’s approval. However, he said that they were anticipating a high fill rate. “We are experiencing much greater demand than we anticipated,” he added. Amos 5 additionally has a powerful C-band footprint with concentrations on Nigeria and another that connects one powerful beam across Central Africa (include the former French territories which also enjoy a Ku-band focus) through to East Africa. 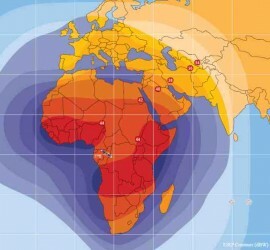 Its Africa Ku-band coverage also includes a Southern Africa beam, and with beams also hitting Nigeria and Kenya/East Africa. Elevation angles are excellent which reduces the risk of interference. Ilany says this is key because local regulations in Africa are less enforced than Europe and thus teleports always have to worry about interference. Ilany added that all of its existing teleport clients were on board with the new satellite, and gearing up for new services. Ilany recognises that Ku-band, and its rain fade problems, represents a harder sell than C-band, but says Spacecom is seeing more and more interest in Ku-band for its DTH potential. “And this also includes for cellular backhaul, where we are in discussions with a major player who will use us for mobile cellular backhaul in Ku. Backhaul is a critical infrastructure for mobile operators in these regions. Its usage is booming. There is some microwave and a little fibre, but our satellite sector is growing in importance. With the right configuration and the right planning it all works with very high availability – and it’s more cost effective.” Amos 5 has a powerful C-band beam peak just West of Nigeria, and a Ku-band peak with concentrations over Nigeria, but both providing great coverage over Central Africa including the Francophone territories and stretching to East Africa. Ilany added that most of the embryonic and would-be DTH broadcasters planning for Africa national or regional coverage need to carve out new customer niches while recognising that sport might not be part of their offering. This assumes that Multichoice/SuperSport continues to dominate sports-based pay-TV transmissions over the region, although there could be more interest as and when the current TV rights come up for renewal. One current change to Spacecom’s portfolio of clients (at 4 degrees West) has been caused by the USA’s withdrawal of the military from Iraq just before the Christmas holiday. This has reduced the demand from the US Dept. of Defense and governmental demand generally. Amos was supplying capacity for troop entertainment and home contact. This has freed up some much-needed capacity, says Ilany. He said that Spacecom’s aim is to have 5 satellites working from 3 orbital slots within the next 3 years. Together with Amos 5, two new satellites (Amos 4 and 6) will greatly expand Spacecom’s capacity. Extra capacity is coming on stream covering Central and Eastern Europe, and the Baltic regions, as well the Middle East generally and Africa in particular. This expansion in capacity will drive Spacecom’s revenues forward dramatically, and some reports suggest that the overall aim is to see a tripling of revenues within about 5 years. The diversification is necessary. Some 35 per cent of Spacecom’s current revenues flow from the ‘Yes’ DTH operator over Israel. Thankfully, Yes has expanded, both in the number of channels on offer and with its shift to HDTV (and even 3D). – Amos 4 will go to 65 deg East, and is now scheduled for a 2013 launch, perhaps using a SpaceX rocket with which it has a launch option. – Amos 6 will go to 4 deg West, scheduled for launch in 2014 and will replace Amos 2.